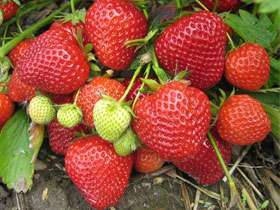 A superb new mid-late season British raised strawberry with a 4 week picking season which goes on for 10 days after Elsanta, the predominant mid season variety. It is typical to be harvesting Lucy from Mid June to Mid July. Lucy bears attractive, shiny heart shaped berries that have a very juicy, sweet taste that are well displayed for ease of picking. Recommended as a very easy variety to grow, Lucy is resistant to crown rot and also performed the best of all varieties last summer, when so many were a rain washout, Lucy kept producing good, well flavoured fruit. The parentage is complex, involving an Autumn fruiting and a Day neutral variety, and this is undoubtedly what has contributed to the extra-long season. Lucy is a very hard working variety that will become a staple of many planting programmes for years to come. Easy to grow, lovely flavour and a super-long season, Lucy is highly recommended.